As he crouched in the shadow of the Archive terminals, he was shaking. The sounds of heavy marching and death were ringing through the chambers of the Temple. To not cry or scream took all the effort the small boy could muster. With every fallen stone column, broken wall and blaster bolt, a new wave of fear swept over him. Fear was supposed to be the path to the Dark Side, but the teaching of “There is no chaos, there is harmony” seemed a million light years removed from the calamity engulfing him right now. He had been practicing with the training droids when the first sounds of war echoed through the previously untouchable Jedi Temple. His only thought was to take cover among as many of the Jedi artifacts and holocrons, in the hope that this new enemy could not discern his presence from the Force energy emitting from the relics. He only hoped his trembling state did not give him away. It seemed an age before the heavy-footed marching and the Lightsaber ignitions and deactivations began to die away. He crumpled to the floor and hugged his knees, silent tears drenching his robes. Once again in life he found himself alone, his only stability in life wrenched from his young hands. He tried to focus on what he was taught during his meditation classes, but the peace that comes through the Force seemed to elude him. He attempted to perceive the state of the Temple beyond the closed doors, but so early in his training he could only pick out the fire and the destruction. Despite the Force being organic, he as yet could not perceive life forms beyond the walls. Only when he felt sure he couldn’t hear any more enemy footsteps did he tentatively drag himself to his feet. Edging towards the Archive door he put his ear against it, only to pull it back immediately due to the immense heat. If he stayed here forever, he would be lost. He took a deep breath and opened the door with the nearby terminal. What he surveyed bore no resemblance to the teachings of the Jedi. Chaos reigned. Negative emotion swelled inside of him. Death was everywhere. And the worst part was he did not understand what had just taken place. “There is ignorance after all”, he whispered to himself. He picked his way through the Temple, passing fallen Masters, Padawans and Younglings. What was once a majestic, awe-inspiring monument to enlightenment, honouring the Force now lay mostly in rubble. I have to make my way to my Master’s Chamber. Several time he fell and cut himself on fallen shards of rock or marble. Pushing pain away was something he was learning to do, though healing would take time. With a huge effort he dragged himself up the sweeping stairs to where his Master was supposed to be meditating. The door was blown open and the walls were plastered in blaster bolt and Lightsaber burns. And his master, only recognisable by the gold and white robes he always wore, was sprawled over his meditation alter, eyes wide open and his jaw hung loose as though he was cut off half way through a scream. The child gently closed his Master’s eyelids and finally could hold back no more, his wails being the only sound echoing through the now deathly-silent Chambers. Once spent, the young Cor-Jhan knew he had to leave the Temple and escape. Not that he knew where he would run to. With total Force of will he stood and dusted his robes off. Not that it made any difference, dirty as they were from soot, sweat and tears. 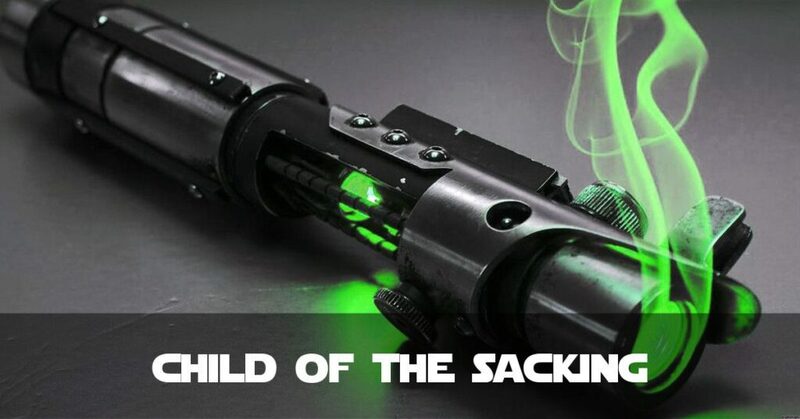 He looked down and saw that in his Master’s hand was his Lightsaber, delicately engraved with green swirls as though wrapped in the tendrils of some vine. Cor-Jhan carefully removed it from his Master’s hand. This was not just a weapon, this was a memory. Clipping it to his belt he began the painstaking job of leaving the Temple. Alone he must stand. Alone he must leave. Peace certainly felt like a lie.